Now is the time of year when homeowners get serious about clearing out the clutter. With spring cleaning underway, it’s time to dust off those items you haven’t used all year and have a yard sale with your neighbors. Do you find it difficult to part with anything, having formed an emotional attachment? Do you have collections that must stay together? The problem is when those attachments put you or your family at risk. 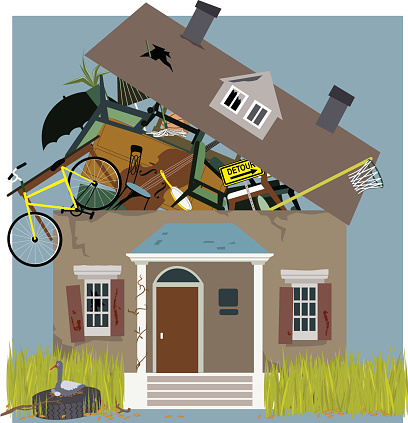 Here are six dangers associated with hoarding. When your path is blocked, you or a family member could trip or fall and sustain injury. Piles and stacks can grow as tall as the ceiling, toppling onto family members or yourself, trapping you underneath it all. Pest control experts will tell you that insects and rodents love clutter and a hoarded home is their ideal environment. The problem is your health is compromised as you can be infected by diseases pests carry. Do you find yourself keeping leftovers and other food items that have expired just because you can’t throw them out? Mold growth is a serious issue for hoarders, resulting in infestations and respiratory and other health issues. Are you or a family member allergic to dust? Clutter from hoarding will create more dust, odors, and ammonia making it difficult to breathe for your family and pets. A home that has been filled to an excess will eventually become damaged structurally. It will be harder to access HVAC equipment, for instance. The entire integrity will be at risk. Removal of contents using a staging area where items are sorted and determined what is permitted to be discarded in the trash and what cannot go there, such as paint. We also provide a dumpster-sized receptacle. Reach out to your trusted damage restoration professionals at ServiceMaster to get started with clean-up from top to bottom. ← What causes sewage backups?